To support you when you are working at height our three section push-up ladders offer impressive grip for safe operation. 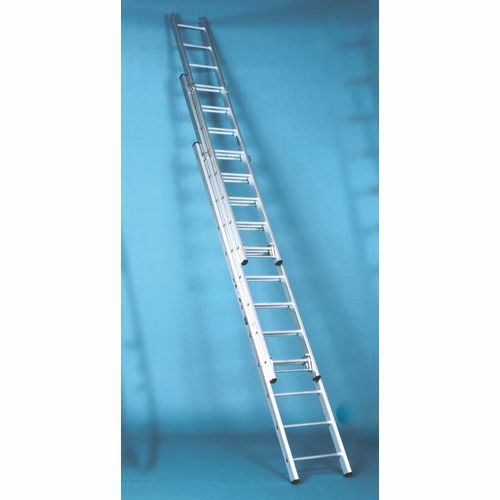 These heavy duty ladders offer sturdiness and strength; they are lightweight due to being built with an aluminium construction, making them easy to transport and carry from location to location. Manufactured to British Standard 2037-1994 Class 1 for heavy duty industrial use ensures that they are reliable, strong and safe for any worker to use. Serrated rungs fitted through the stiles at a standard rise of 250mm give comfort to the user as well as extra grip for their feet, while the heavy duty box section stiles with radius corners reinforce the strength. Our ladders are available in four extended heights; 7.3, 8.8m, 10.3m and 13.3m - their serrated rubber feet help to keep them stable when placed against a wall or on another surface. These are three section push-up ladders with 12 months guarantee and FREE Delivery.